Steel Splendor's luxury hand-held design draws in and mixes the proper amount of air for the right amount of time, allowing your wine to breathe instantly. When wine is poured into the diffuser, its internal design creates an increase in the wine's velocity and a decrease in its pressure. The pressure difference draws in air which merges perfectly with the wine creating the optimum aeration. 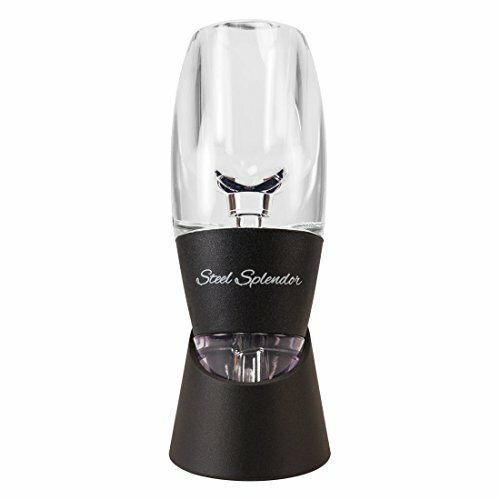 The Steel Splendor Wine Aerator delivers a better bouquet, enhanced flavors, and a smoother finish. EASY TO USE - Pour any wine through the decanter directly into your glass. Makes any wine taste like a century-old treasure. SAFE - Unlike other brands, this diffuser is made of high-quality, FDA-approved, food-grade acrylic. Unbreakable, BPA-free, and no sharp edges. GREAT VALUE - Includes gift box, aerator, diffuser filter, velvet carrying pouch, and decanter base. LIFETIME GUARANTEE - Substantial, sturdy, shatterproof and safe. Lifetime replacement warranty. MAKES A GREAT GIFT - Comes in a gift box, making this the perfect gift for wine enthusiasts, women and men alike. If you have any questions about this product by Steel Splendor Luxury Drinkware, contact us by completing and submitting the form below. If you are looking for a specif part number, please include it with your message.